A website, named InternetLiveStats, tracks internet usage. One of the metrics that the site tracks includes the number of websites registered (unique page with a server and IP address.) 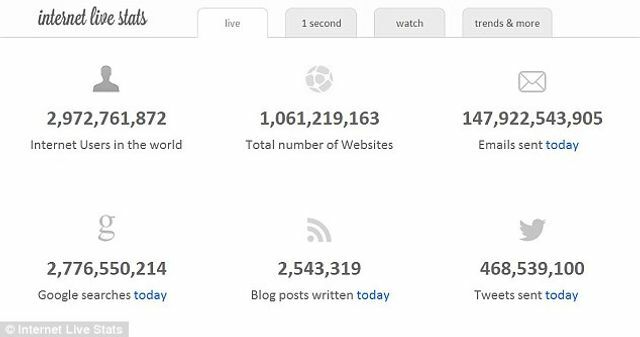 September was the first time that InternetLiveStats reported more than one billion websites. InternetLiveStats is a great website if you're looking to be amazed by the constant growth of the internet. In the time it’s taken you to read this sentence, at least four new websites have been registered. And according to figures from an internet tracker, the total number of websites now exceeds one billion. The figure, and the exact time and date the milestone was reached, still needs to be verified, but it is believed to have been achieved earlier this month.